Established in 1877, Evergreen Cemetery is the oldest nondenominational cemetery in Los Angeles, with numerous prominent interments on its grounds. 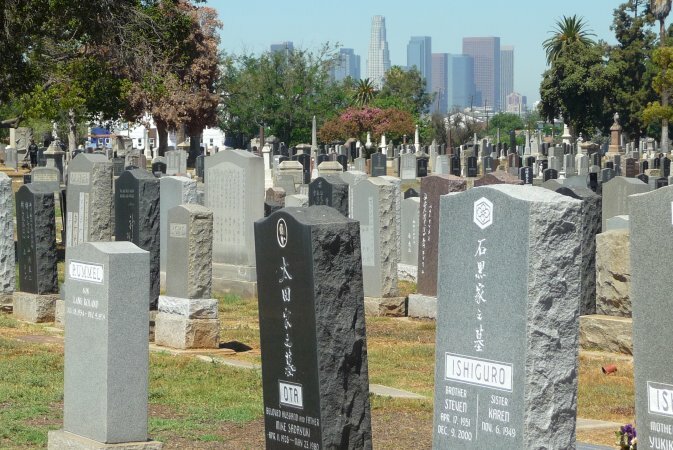 The Eastside is home to numerous historical cemeteries, revealing early planning practices in Los Angeles that placed burial sites beyond the border of the developing urban center. Prior to the cemetery’s completion, the City requested the allocation of five acres for the unclaimed bodies. This area became known as a “potter’s field.” Though there is no equivalent to the potter’s field today, each year 1,500 of the city’s homeless or unidentified persons are cremated and buried in a single grave within Evergreen Cemetery. As a sign of the multiethnic identity of the Eastside, the cemetery established wide parameters for interment, although the site was segregated by ethnicity, with separate sections established for African Americans, Mexicans, Japanese, Armenians, and white settlers. For decades, the Chinese community was only allowed to bury its dead in a corner of the potter’s field, leading to the construction of a shrine on the site in 1888. Unlike other interments in the field, the Chinese were required to pay $10 for burials. In 1922, the community purchased land on 1st Street and Eastern Avenue and relocated most of the remains to the new Chinese Cemetery. The Chinese Historical Society of Southern California purchased the shrine and its plot of land in 1992, and it was later declared a Los Angeles Historic-Cultural Monument. Evergreen Cemetery also contains a memorial for the 442nd Infantry Regimental Combat Unit of Japanese soldiers. Although the memorial was dedicated in 1949, the entire unit received the Congressional Medal of Honor in 2010. In 1966, the Garden of Pines was created in honor of Issei (first generation) pioneers. Dozens of prominent LA figures have been buried at Evergreen, including Charlotta Bass, Biddy Mason, and members of the Hollenbeck, Lankershim, and Van Nuys families. In 2008, a jogging path was added to the periphery of the cemetery. A mile and a half in length, it is meant to serve community members who previously had little access to parks and spaces designed for physical activity. In 2005, construction workers discovered the remains of 174 people while excavating First Street for the extension of the Gold Line. Archaeologists determined the site to be the original location of the Chinese graves in the potter’s field. In September 2010, a memorial wall and meditation garden was dedicated near the Chinese shrine in recognition of this history.